Here’s part TWO of a 1938 Felix the Cat adventure by Otto Messmer. Felix has befriended a rooster named Cocky, and they’re on their way to Mexico to get in cockfighting racket! Thinks start to heat up in the next chapter. Check back soon for Part THREE: Cockfight! Animation Jobs @ Cartoon Network! Every one of these drawing by Otto Messmer just boogles the mind and inspires the drawing muscles. The cartoony vivacity of his poses and expressions just can’t be beat! So go take a look at these Felix comics from 1930. There’s more great cartooning in these seven Sunday strips than in all of today’s newspapers combined. Thanks to Chris Lopez at ComiCrazys for sharing these! New “Culture Corner” book by Basil Wolverton! Messmer’s artwork from this period is so bouncy and alive…joyfully cartoony and all-out fun! STARZ/Film Roman is looking for a experienced Storyboard Artist who can draw in the style of "The Ren and Stimpy Show", "The Mighty B" and similar styled shows. 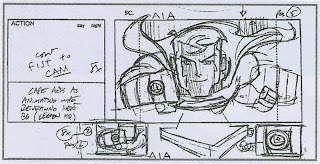 Experience in Digital Storyboarding with Photoshop is a must. Please submit PDF Files to shelley.mccully@starz.com or call 818.748.4003 with any questions. Remember a few months ago when I started posting some old filler comics by Bud Sagendorf? Wait...you don't remember? These old comics starring "Sherm" began running as back-up stories inside the Jan-Mar 1952 issue of Popeye comics #19. Click HERE to read the very first "Sherm" comic by Bud Sagendorf. 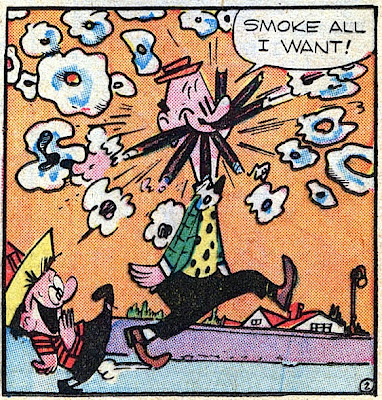 Today's comic, "Sherm and the Race," is from Dell Comics’ Popeye #24, April-June 1953. Art and Story by Bud Sagendorf. Next episode: Sherm Falls in LOVE! Complete Milt Gross Comic Book Stories is On Sale NOW! Yippee!!! The Complete Milt Gross Comic Book Stories is finally IN STOCK at Amazon! Just got mine via FedEx today...it's BEAUTIFUL! (insert sound of weeping for joy!) Complete Milt Gross Comic Book Stories is a beautifully designed book collects the complete comic book stories of comic genius Milt Gross, culled from rare, impossible to track down comic books of the '40s, which have been lovingly restored. This thick, full-color, 368-page hardcover book, in addition to exhuming every one of Milt Gross' wild and crazy comic book stories, shares rare photos, sketches, and unpublished art, including the previously unknown cover to the Milt Gross Funnies #3! All the comics are lovingly photographed from the old yellowed comic book paper of the original comics. The coloring looks totally natural against the off-white, pulpy-textured paper. The paper itself is very hefty and thick, so there is no bleed-thru or transparency of images. This is a solidly-built book, with a strong sewn binding. I will post a review of the biography and all the extras as soon as I get a chance to properly wallow around with this beautiful classic comics collection! A couple years ago I posted a fantastic seven-page Count Screwloose comedy epic from ACG's Kilroys #5. Just CLICK below on the goofy dude smoking a mouthful of cigars to jump over and see that delicious set of vintage comic book scans! And here's John K's great tribute to Milt Gross HERE. The Asifa-Hollywood Animation Archive has some super scans of Milt Gross newspaper comics like Count Screwloose and Dave's delicatessen HERE. This “Charlie Horse” 5-pager is exactly the kind of comics I love to see: oddball and unpolished golden-age funny animal comics that fall outside of the generic house-styles. Anyway, on that basis, this one’s a winner – And check out that cool angle in the second panel of the fourth page! Charlie Horse by Hal Cooper from Hit Comics #41 July 1946 I couldn’t find much info on cartoonist Hal Cooper … according to “Who’s Who of American Comic Books,” Hal Cooper was the founder of the Cooper School of Art in Cleveland, and worked on other filler comics like Atomic Tot and Marmaduke Mouse. If any of you have any more about this funny animal cartoonist, please let me know! Please have samples FROM PRODUCTION of Action/Adventure production work. If your portfolio is currently at WBA, you need not apply again. Portfolios can be dropped off M-F, 9am-6pm to 411 N. Hollywood Way, Burbank, CA 91505. Inform the Guard that you are here to submit a portfolio for Warner Bros. Animation, and you will be guided through the process. Sherm's Note: I don't work at Warner Bros, so I don't have any more info than this. Good luck! Nickelodeon Animation Studios is looking for several artists for its newest show, Robot and Monster: Best Friends Forever! Please Note: Because these are artistic positions, a test will be required. To apply for this position, you must submit your resume online at www.mtvnetworkscareers.com. The listing is filed under Location: Burbank. Please follow up by submitting a flat book portfolio (do not include any original artwork) and a digital DVD displaying your art directly to the animation studio. Before we can review your portfolio, you must fill-out a portfolio release form. To download the form, please go to: http://nas.nick.com/SubmissionReleaseForm.pdf. Please include a cover letter and resume stating the position or positions to which you are applying. Please Note: We would like to fill these positions ASAP! Get your work in as soon as you can; the reviews will be happening shortly. Sherm's Note: I don't work at Nickelodeon these days, so I don't have any more info than this. This is time-sensitive info, so if you're interested, get clickin' and applying! I drew these a few years ago as a favor for a friend -- he needed some multipurpose "clip art" figures for his website. Don't think he ever used 'em, so here they are on my blog!